This is a small serrated folding knife. I wasn’t able to figure out what it was used for–the serrations are very fine. As you can see in the photo, the sides are ground slightly and taper towards the cutting edge. The back of the blade is about .020″, and it tapers towards the cutting edge which is a very thin .010-.007″. 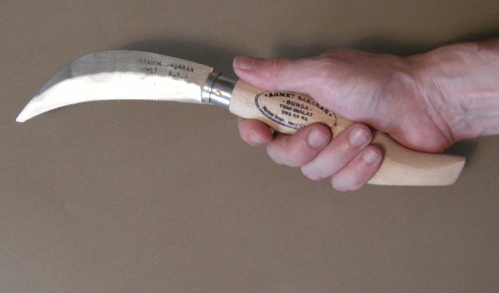 The shape is similar to a modern pruning saw which also has a pistol type handle. It was made in Bursa, Turkey, which is the center for metal working– like Sheffield in England, or Solingen in Germany. I find the handle the most interesting feature since it fits comfortably into the heel of the hand. It cuts, Eastern style saw, on the pull stroke. It cost $4.00 and was quickly made- note the crude ferrule and pivot pin, however the complex curves on the handle must have taken some time. But it feels surprisingly solid. This illustration is from a Ward and Payne Ltd., Sheffield catalog, circa 1910’s. This is called a Turkish Saw (aka. Monkey saw) According to Salaman’s Dictionary of woodworking tools, they are common in Greece, Crete and Turkey and are used as a dovetail or small tenon saw. Again, it cuts eastern style on the pull stroke, so the blade can be made thinner. And like the knife above, the handle looks very comfortable, since it extends near to the wrist at the very end. German speacing people call such a knife ‚Hippe’, i.e. popular word for ‚goat’ or ‚thin girl’. Thanks! Any idea what the goat is used for? Interesting, because I bought this knife in a wine producing area of Turkey. Given the very fine serration’s on the knife, it makes sense the shoots must be somewhat frozen. Danke schon. This folder is called “zivana” here. Some also call it “bicki” or “testere”(saw). I am unable to write the pronunciations; sorry for that. It is used for pruning. It is -obviously- somewhere between a saw and a knife. It is serrated because it performs better than using a plain edge blade when pruning. This is not a for-winter tool by the way. It is/was also used to harvest sunflower, corn, etc. By the way… Yes, the traditional Turkish saws are pull saws. I do not know much about turkish pruning knives, but I can confirm this style is (or was) common thoughout the Ottoman empire – it survives in the identical shape of both handle and blade with a serrated edge in Bulgaria. Currently en example for sale on eBay.fr (search for serpe, serpette or couteau vigneron. Vine pruning takes place in March, but the pruning knife has been replaced by the secateur. The knife probably survives as a gardener’s pruning knife, but may still be used at harvest time to cut the grapes from the vine. Serrated blades are often found on sickles used for harvesting wheat and rice in many Meditteranean countries. My own primary area of interest is in the larger fixed blade pruning hooks or billhooks. Billhook (also bill hook and bill-hook) also has other meanings – as a spike to put old bills (invoices and receipts) on, or as part of the knot tying mecahanism on a reaper/binder or baler (receipt is also the old word for recipe, and this knot is tied in a piece of string, not found in a piece of wood) – most words have many meanings. The link above takes you to a website where a ‘hippe’ is more commonly called a ‘haumesser’, to which I have added further links to others sites where other names and spellings are used. If anyone can help with my list of words for this tool, in any languaqge or dialect, please post it..
Hello very interesting this. Any idea if it is easy to buy online in Europe somewhere? This saw is made in our company. Brand name is Ahmet Basaran which is one of our trademark. Totally hand made, even shape of handle. Steel is carbon steel and produced like as forged knives. Each serrated edges are manufactured one by one. 72 steps are followed to finish it. If you plan to visit Turkey- Bursa, you can find different models in this address. Also images of other tools made by the company, or of the manufacturing processes, would be very useful…. Many thanks for the post ref erkulbicak.net – they appear to make all types of tool except the fixed blade pruning hook (billhook)….. Thanks for the other link as well – it appears they are still made and used elsewhere in Turkey…..
Now for another request – do you know of any links on the history of this tool, examples of early billhooks etc….. Were double edged tools (i.e. with a back blade) used for pruning, as used elsewhere in the Mediterranean region (from Greece to Portugal in the north, and Malta to Morocco in the south???? Any billhook variant I have seen in Turkey is single edged but I personally have no data about the history of this tool. 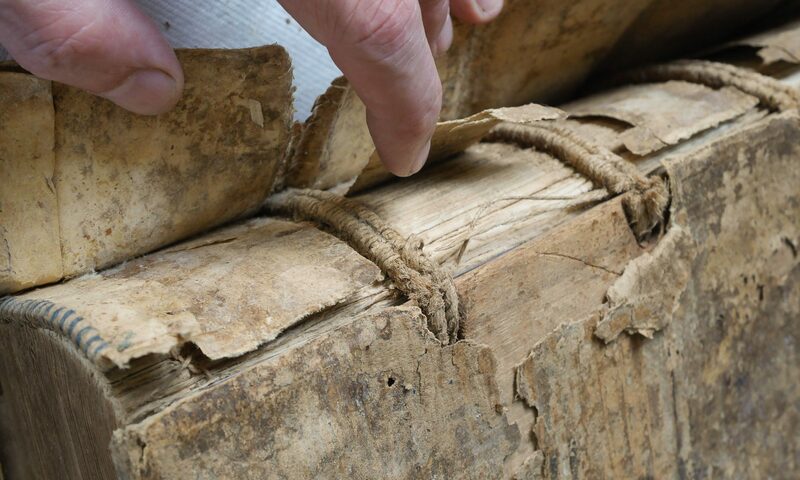 Probably the back edge is not needed or found to be dangerous or risky. In Turkey double edged axe is also not used. I only know some historical military axes to be double edged. Common use of this tool through the Mediterranean region may be explained with the common presence of shrubs. This explains the demand for the tools. Maybe Scythians introduced this tool. IMHO, this also explains why this tools is known in a wide area. This looks almost exactly like the Banana knife we used in Israel. Everyone called them Turkish knives, so I guess that’s it. They were used to cut the stalks and trim leaves in the fields. Serrated worked much better than the smooth blade. Serrated sickles were made in most European countries to harvest wheat by hand, especially in small fields – although made redundant by the larger scythe and later mechanical reapers and combine harvesters, they were still being made well into the 20th century ( I guess mainly for export). In Morocco small serrated sickles are still made and used, but the edge is not sharpened – not sure what they are used for. The Turkish knives would appear to be an Eastern Mediterranean/Balkan version of this type of blade. this knife can be bought at Great Dixter House and Gardens in Northiam East Sussex UK. It is a very handy tool for cutting down perennials and harvesting vegetables. the gardeners at Great Dixter have been using it for years to work the borders.